Last week we published a list of the top 10 IT challenges facing small business in 2019. Over the next few weeks we are going to break down those challenges and look at them in a little bit more detail. We hope to be able to help businesses overcome some of these challenges themselves, whilst also showing where fully managed IT support can help. It’s obvious that waiting for equipment to break down is not the best way to manage your IT. A break down means that employees can’t work, this costs money in lost productivity. It can have a knock on effect with your clients, especially if you can’t meet your obligations to them. Regular maintenance can help. However, it takes time and a level of expertise to do this. Outsourcing your IT to a Managed Service Provider (MSP) such as Your IT Department is the obvious solution. But if you don’t feel that a fully managed service is quite for you at the moment then there are some maintenance tasks you can carry out. Number 1 is extremely simple: shut down your computer or laptop when you have finished for the day. Don’t close the lid, lock the machine or put it to sleep. Shut it down fully and properly. You need to ensure that your Operating System and software are up-to-date. Microsoft have made this easier for Windows 10, and the user has more control over when things happen. This means fewer interruptions and restarts. Windows 10 updates automatically download and install when they’re available. Occasionally, your PC may need to restart to finish installing the updates. 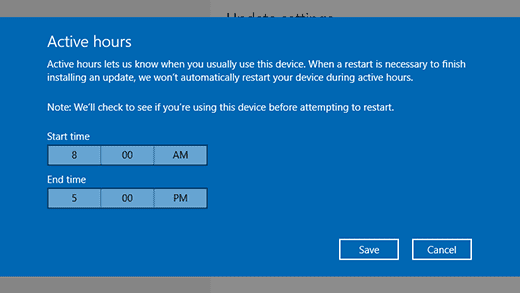 You can set active hours to let us know when you’re usually using your PC to help prevent inconvenient restarts. Other software can be more problematic. Some of the apps will have built-in updaters which will automatically check for updates and notify you to install them. Do not ignore them. Besides improving functionality patching is extremely important for cyber security. Some apps offer no built-in updating requiring you to go to the product web site, download updates and new versions and install them yourself. These apps may still notify you that a patch is available. You could purchase software for automated patch deployment. There are a number of options available, but cost can become an issue. One of the lowest cost options is Ninite Pro. This costs £1 per machine per month. However, even this is going to require someone confident with IT to use it. Device drivers, commonly known simply as drivers, are the files that enable your hardware devices to communicate with the computers operating system. We would recommend that you adopt a ‘if it ain’t broke, don’t fix it’ approach with drivers. Windows will download hardware drivers for most of your devices and keep them up-to-date. You should generally just let this happen. Some manufacturers versions of drivers, especially those for graphics cards, come with extra features and software. However, these are often more relevant for gaming etc. As a rule of thumb, leave well alone and let Windows do its thing! A lack of free space of the Hard Drive will make your computer or laptop to run slowly and may cause freezing and crashes. Therefore, it is worth keeping an eye on the space left on your drives so you can take action before you start to get issues. To find out how much space you have open file explorer and click on ‘This PC’. This will show you your drives and how much space is free. Right-clicking the drive and selecting ‘properties’ will provide further information. 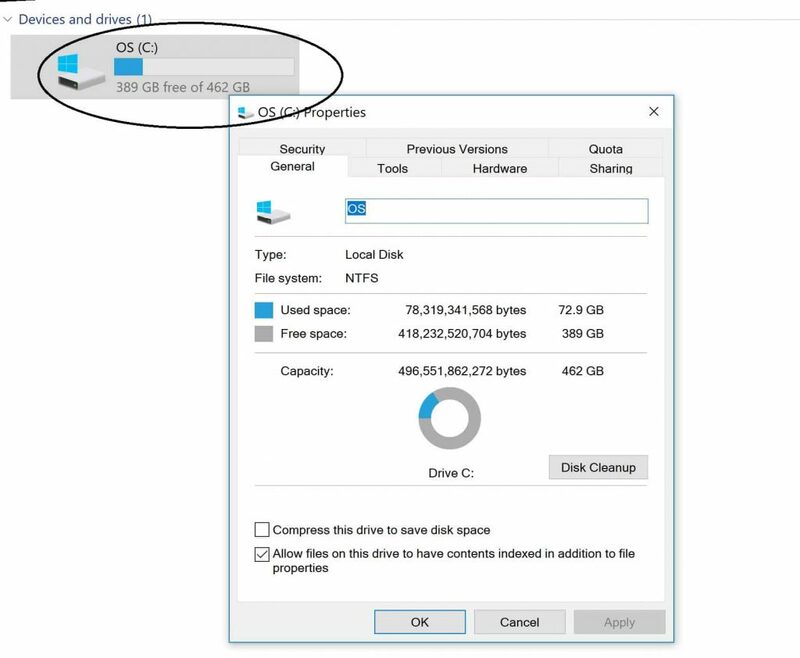 There is no hard and fast rule as to how much space you need to have free but as a rule of thumb a mechanical drive should have around 15% free and an SSD 20-25%. There are a number of things you can do to free up hard drive space, How To Geek suggest 7 in this useful article. However, the easiest one is to delete files you no longer need. Pictures and videos particularly take up a lot of space, so ask yourself if you really need them on your PC and, if not, delete them. We are going to go into a bit more detail in a future article about cyber security. However, at the very least ensure you have anti-virus installed, up-to-date and working. 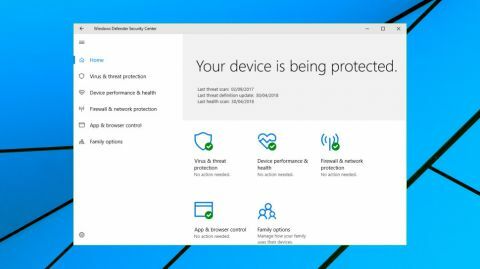 Windows 10 includes Windows Defender Security Centre so there are no excuses. Windows will keep it up to date and you’ll have to disable it on purpose to not use it. Ensuring users don’t have a ‘Admin’ access is a good idea. This can stop them installing things they shouldn’t and is worth the occasional ‘nag’ when people genuinely need to download new software. It is always tempting just to solve an immediate issue and then hope for the best. The obvious example is to turn the computer off and then back on again. This will often solve an isolated issue, but if the problem reoccurs then just rebooting again is only going to give you the same temporary solution. To be honest we would recommend getting a professional involved if you’re experiencing a recurring problem. However, there are some things you could do if you are confident. As a disclaimer we do not recommend these actions; you undertake them at your own risk. First the good news; if you’re doing the above you should have few problems. If you are experiencing your computer running slow, freezing, or restarting unexpectedly start by making sure everything is up to date and that you have some space on the hard drive. Overheating can often be a cause of random crashes. The most common cause of an overheating computer is blocked airflow through the computer, often caused by dust or debris. Other issues could be a failed or failing fan. Follow our ‘Top 5 Tips To Keep Your Computer Cool‘ to ensure you are not suffering from overheating. Once you’ve got everything up to date, free’d space on your drive and ensured the PC is not overheating if you are still experiencing some problems it’s time for some more advanced troubleshooting. Firstly think about any recent changes to the system. Have you added any new hardware, or installed a new app or program? If so try removing the hardware, app or program. If this solves the issue great you’ve got the root cause. You can now look at alternatives. If you absolutely need that specific piece of hardware or software we’ll look at what you might do in the next section. If you’ve gone through the basics and not added anything new then you’re going to have to dig a little deeper. When you experience a software or driver issue you will most often experience a Stop Error and Windows will automatically reboot. You need to stop this so you can read the error code which will help with troubleshooting. Using the WinX Menu of Windows 10, open System. Next click on Advanced system settings > Advanced tab > Startup and Recovery > Settings. 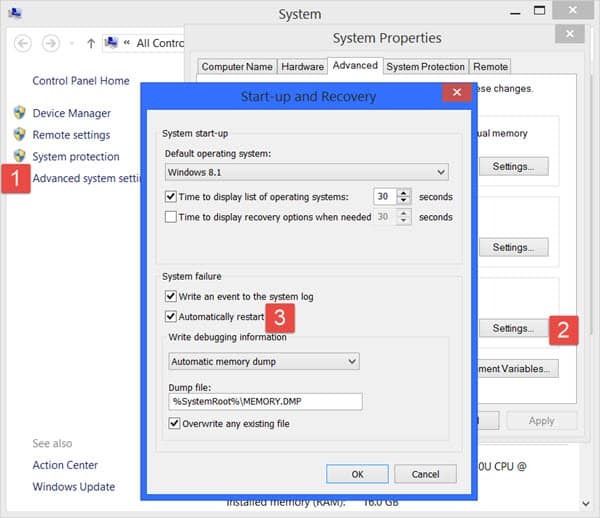 Now if your Windows were to crash due to a Stop Error, it will not restart the computer but will display the error message, which can help you troubleshoot the Blue Screen. Once you’ve got the error code this post from the Windows Club will help you troubleshoot the issue. This is complex post, in technical language, which links off to a number of other articles. Again, we recommend getting a professional involved before you start following steps such as rolling back drivers, or updating BIOS. This really isn’t for the ‘casual user’. Viruses or Malware could also be a cause of recurring issues such as freezing or restarts. Firstly run a deep scan through your Anti Virus software. We would then recommend getting a 2nd opinion. Something such as Malwarebytes Anti-Malware Free can often detect and remove malware that even the best Anti-Virus Solutions miss. However the free version does not offer real-time protection, scheduled scanning and scheduled updating. Therefore it is best as a program to be used in addition to your main AV. There are a number of other options for a 2nd opinion here. In very simple terms integration issues happen when shiny new technology brought into the business doesn’t work with the old technology that already exists. This could be existing software that won’t work on a new PC with a newer version of an Operating System (OS). Or it could be that a new piece of hardware such as a plotter will not work with an older machine. This is an issue where you need to prevent, rather than cure. Thinking about your technology needs both now and in the future can avoid many integration problems. Any purchases need to be considered carefully, and the compatibility with existing infrastructure checked prior to purchase. For our clients on fully managed IT support we produce an IT Roadmap, which incorporates an IT refresh plan. As part of our service we install an agent on to our clients systems. This gives us information on PC age, Operating System, App’s, drivers etc. which is pulled into software called IT Glue. IT Glue will flag up to us equipment and software that is coming toward end of life. When a client enquires about new hardware we can ensure that anything purchased can easily be integrated with what is already in place. We’ve gone into detail on producing an IT Refresh plan in a previous blog and this is something you can do yourself. You don’t need software, just a simple spreadsheet, the knowledge to find the age of equipment and the time to complete the task. This kind of exercise should prevent integration issues where infrastructure is relatively simple. You can easily avoid one of the most common integration problems that we see. We often see businesses buying low cost PC’s and Laptops without considering the operating system. The lowest cost machines most often come with Windows 10 Home. This may be fine for what you need, however if you use want to use a business server either now or in the future, then Windows 10 Home Edition is not the right choice. Whilst there may be a short term saving when buying a Windows home edition the upgrade to Pro can often be cheaper when you buy rather than at a later date. This is especially true as you might need someone to install the system. Planning, research and careful consideration are generally the only tools in preventing, rather than curing integration problems. If you find yourself in the position where a new purchase has stopped things working it’s likely time to call in the professionals. For example it may be possible to run older software in compatibility mode, or an older OS could be run on a virtual server. These issues can be minimised and resolved in-house but the work required takes a considerable amount of time.